Posh are away to Sunderland on Tuesday October 2. 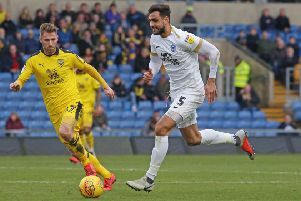 Peterborough United will begin their 2018-2019 League One campaign with a home game against Bristol Rovers on Saturday August 4 (3pm). Posh make their first away trip of the season the following Saturday with a journey to Rochdale. League One newcomers Luton Town will visit the ABAX Stadium a week later on Saturday August 18, which is then followed by back-to-back away fixtures at Charlton Athletic (Tuesday 21st August) and Plymouth Argyle (Saturday 25th August). Steve Evans will take his Posh side to recently relegated Sunderland on Tuesday 2nd October, with The Black Cats visiting the ABAX Stadium on Easter Monday (22nd April). Peterborough United’s final home match of 2018 will be against Walsall at the ABAX Stadium on Saturday 22nd December, with Posh facing an away fixture at Barnsley on Boxing Day, followed up with a trip to League One new boys Accrington Stanley on Saturday 29th December.